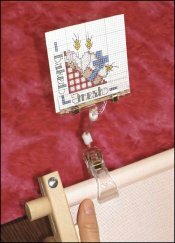 Chart/Graph Gripper Pattern Holder  - $6.10 : Yarn Tree, Your wholesale source for cross stitch supplies. Item 3524. Graph Gripper, Chart Gripper. Keeps your small pattern or chart right in front of you as you stitch. Clips to scroll frames, Q-snaps, and stretcher bars. Rod clip opens to max. 1”. Graph grip is 3” wide. Lightweight. Has small ball joints for angle adjustments.